Our Western culture seems to be enamored with bottled water. Whether fresh from the spring or just out of the tap, it seems to be an easy method in our quasi race to be healthy. You have probably seen some of the television and online commercials displaying the massive quantity of plastic bottles that this love affair is producing. In our attempt at complying with the medical reason to drink water, we have taken this topic to excess (as usual) and we are producing a major pollutant that is rising as a priority environmental problem. According to WWF (World Wildlife Fund) we manufacture billions of tons of plastic every year for the plastic bottles that we carry around with us. While many of us accomplish our due diligence to recycle these bottles, most do not. We therefore see these bottles everywhere: in landfills, on the streets, in the parks and in our lakes and oceans. It is estimated that around 86% of the oceanic pollution is currently plastic. The problem is so bad that there are now ‘islands’ of plastic, linked together, floating in the oceans. 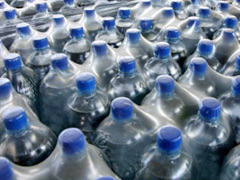 In addition, there are large quantities of energy and polluting related manufacturing needed to make these bottles. Since they are a petroleum product, we are inducing a continued need for oil. All in the name of drinking the required ounces of water every day. In landfills, the resins and BPA can leak into the environment, the water system and combine to make a toxic cocktail. Something to note is that the process of recycling the plastic takes far less in green house emissions than the actual production of the bottles. You might think that it would be a good idea to just wash out your water bottle and reuse it. Unfortunately, that’s a bad idea. These bottles contain phthalates which degrade as the age of the bottle increases and actually adds this chemical to the water itself. Millions of water bottles are aging everywhere, and, unless recycled are actually causing a major environmental impact. An alternative concept that is becoming more popular is to purchase the reusable portable water bottles. Why we need these bottles to be produced in a variety of decorator colors and designs is beyond me, but, one supposes it is to encourage people to buy them because they are attractive. Repackaged as ‘sports bottles’, a down side to that is again, what the bottle is made of. Most contain BPA (Bisphenol A) which is used in the manufacturing of plastic bottles. The studies and reports vary on the toxicity of BPA, but it comes down to the higher the quantity in the plastic bottle, the more of a serious health concern it is. We need to make a complete turn around about our obsession with bottled water. As a culture, we are going to destroy the environment unless we make this change. There are BPA free and environmentally safe water (or sports) bottles that are being manufactured by companies that are also environmentally conscious. Yes, they are a bit more costly, but an investment in just one of these bottles can pay for itself. Filtered water has already been proven to actually be healthier than the bottled water we are so fond of purchasing. The filters are now made to remove many more of the chemicals and minerals that are commonly found in tap water. The answer is fairly simple: purchase a BPA Free, environmentally friendly water bottle and a high quality filter – and you have an unlimited resource for healthy water: just turn on the tap! Posted on December 19th under Pollution Reduction.